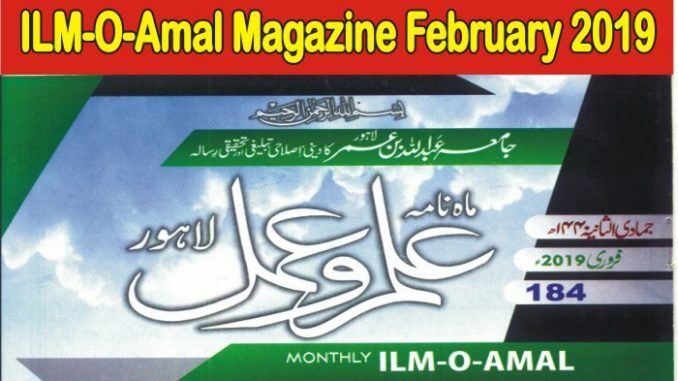 ILM-O-AMAL February 2019 is a Urdu and Islamic based magazine published from Lahore. It published on monthly basis and has millions of its readers in whole world. Furthermore, solution of problems have also been discussed in the light of Sharia (Islamic standards and laws). The aim of publishing ILM – O – AMAL is to spread lesson of love as well as ecstasy. In ILM – O – AMAL February 2019 MAGAZINE, spiritual Islamic cure method have also described in details. Article published in ILM-O-AMAL February 2019 Magzine edition are as below. It also contains many effective skin care as well as spiritual health tips.